Jeffrey Welch's Blog: What Is Positive Reinforcement Training for Dogs? What Is Positive Reinforcement Training for Dogs? Dogster supports positive reinforcement as the best method for training your dog. But what does that really mean? 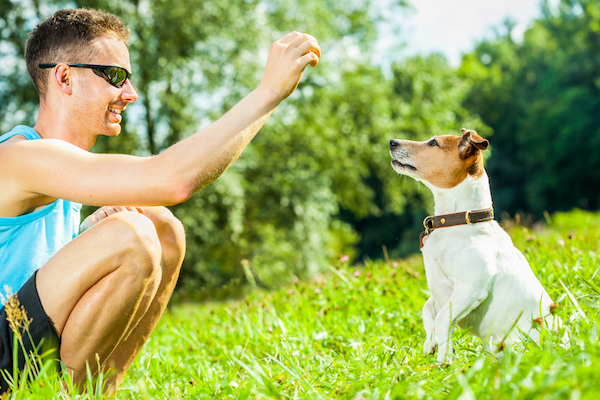 Many people think it involves only training (or even worse, “bribing”) your dog with treats. We recently debunked the most popular myths about positive reinforcement (R+), so now let’s focus on what exactly R+ is and how it relates to training your dog. It first helps to break down the term “positive reinforcement.” In terms of behavior, whether you’re working with humans or dogs, “positive” means to apply something to change behavior, and “reinforcement” means to increase a behavior. Therefore, positive reinforcement means to apply/add something to increase the likelihood that a behavior will occur again. That’s why when your dog sits, you give them a treat. Rewarding the sitting behavior increases the chance of your dog doing it again. There are four total “quadrants” of behavior, and there is a lot of information out there about them, so I’ll just summarize them here so you can see the differences. Positive Reinforcement — To apply/add something to increase the likelihood that a behavior will occur again. Example: giving a dog a treat for sitting. Negative Reinforcement — To take away something to increase the likelihood that a behavior will occur again. The one can range from a Gentle Leader, where the dog feels discomfort if he pulls and doesn’t anymore when he stops pulling, to a shock collar, where the dog is shocked until he performs the correct behavior. The discomfort or pain is taken away when the dog does what you want, in theory increasing the likelihood that the dog will do what you ask more quickly next time. Positive Punishment — To apply/add something to decrease the likelihood that a behavior will occur again. Example: smacking or kneeing a dog in the chest to stop him from jumping on you. Negative Punishment — To take away something to decrease the likelihood that a behavior will occur again. Example: ignoring a dog/taking away your attention to stop him from jumping on you. Man training dog with treats by Shutterstock. Yes and no. It works because everyone and everything wants to avoid discomfort and pain. But that doesn’t mean it’s the best choice. An extreme example: If you hit your dog every time they go into the kitchen, he will stop going into the kitchen. But he doesn’t know why, and now he’s afraid of the kitchen and of you. I have a background in both early childhood development and dog behavior, so I can tell you that from my experience, education, and personal research, it is much more helpful (and more effective) to tell your child/dog what to do than what not to do. This is because they don’t always know what you want them to do instead. While it may be obvious to us that telling a child to “stop running” would mean that they should walk instead, they don’t always get it. A child is more likely to do what you want them to do if you actually tell them what that is, and so is a dog. Also, there is a reason that aversive such as shock collars are actually banned in other countries. 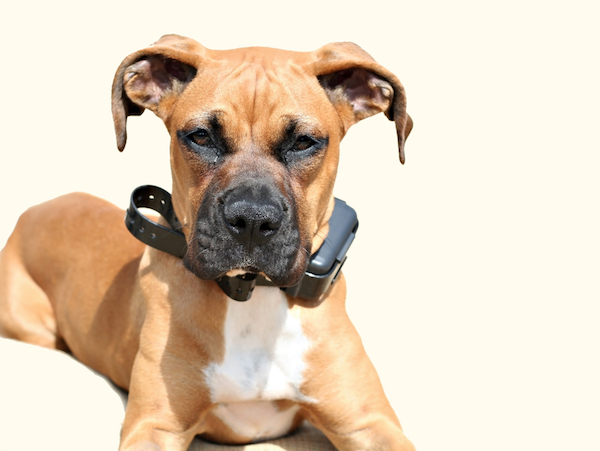 The Kennel Club in the UK found that 25 percent of dogs showed more stress when “trained” with a shock collar than not, and 25-33 percent of dogs yelp when they are shocked. You don’t need to train with pain to get results. Dog wearing a shock collar by Shutterstock. What does positive reinforcement training look like? As I mentioned above, R+ training involves rewarding your dog for doing what you want them to do. Your dog sits, waits, lies down, etc., and they get rewarded. Sometimes that reward is a treat, sometimes it’s a toy, or sometimes it’s petting/attention. Eventually, you won’t use rewards every time, but at first it’s important to reward your dog each time so they know exactly what behavior you are rewarding. What about bigger behavior issues or aggression? Positive reinforcement works great for these types of issues. Most of the time, behavior issues or aggression are rooted in fear, anxiety, or insecurity. Despite what some trainers believe, you do not need to show your dog who is boss or be the “alpha” leader. All of that has also been debunked time and time again. Whole Dog Journal wrote a great article about this topic, as did Psychology Today. It can help if you are more confident, but you don’t need to prove it to your dog. Because most of these issues are rooted in fear, anxiety, or insecurity, it’s our job to go back and re-teach our dogs that what scares them doesn’t have to be scary. Using positive punishment or negative reinforcement can make your dog even more reactive, more scared, or completely shut down, and that’s not the goal. We want our dogs to be happy and well-balanced. Using positive reinforcement training gradually teaches them that the triggers are not that scary, and good things happen when those triggers are around. Check out this story about how I work with my own dog, who has fear and anxiety issues, for an example and some strategies. The post What Is Positive Reinforcement Training for Dogs? appeared first on Dogster.